Glitterball has been confirmed as the new single. It will be released on the 23rd of February as two CDs. The new album is still set for release on the 9th of March. The title is given as Minneapolis . Simple Minds' official web site will be launched in mid-January. Its release has been moved to coincide with record company activity. The site, currently called Helium , is going to be renamed - the band are thinking up a new title. Added two more web sites to the links section. The result is a return after a three-year absence with a new label and new material which is undoubtedly their best work of the Nineties and could yet see them return to the stadiums which they once dominated. - Mike Pattenden writing on Dotmusic. Finally some real news is starting to filter out, and not just the same old tired rumours (which are circulating again). The new album still has no title. (That Helium title is an old rumour and it's just getting recycled). And, as I posted to the New Gold Dream mailing list, the rumoured HMV release date was Monday 9th March. (The 6th March is a Friday - no record company would release an album on a Friday). Is the new single War Babies or Glitterball? Still undecided. But the release date for the new single is mid-February. And also expect a new remixed version of I Travel by the Utah Saints. All the information is here : Dotmusic. Updated the fanzine section with information about a long running Spanish Simple Minds fanzine called Mission In Motion . Who's Doing The Dreaming Now #4 is finished and is now being sent out. Subscribers will get their copies soon. Highlights include reviews of some of the summer festival gigs and an exclusive interview with Alan Stivell - which features information about a rarely seen jamming session in which Jim, Charlie and Alan work on Song For The Siren . Information about both fanzines is in the fanzines section. Simple Minds contributed a song called If I Had Wings to the soundtrack of this film. Jim was asked about the film during a radio interview on the 16th November. He stated that the movie was finished, but the makers were having problems getting a distribution deal. "The people involved were trying to do something rather charming. ... It was nice to be involved because it wasn't just the obvious blockbuster film where they just stick your song on at the beginning or end." Q Magazine reports that the still-untitled Simple Minds album will be out in March, preceeded by a single. More items are listed for sale in the Other Info section. The Italian techno outfit Usura have reissued their remix of Simple Minds' New Gold Dream (81,82,83,84) . Open Your Mind 97 has been released on the Malarky Label (MLK D4). It was issued earlier this year in Germany, but the UK version which was released last week (and is currently Number 21 in the charts), features some much better remixes. The mailing list has been back up for a while now (it was only down for a couple of days), but it will soon be moving onto list server software - information will be posted here and on the list before the move. Want either New Gold Dream (81,82,83,84) or Sparkle In The Rain on coloured vinyl? Check out the Other Info section. The account from which the New Gold Dream e-mailing list is sent has been temporarily suspended. This means that no digests can be sent until Melissa sorts out payment to her ISP. I have no idea how long it will be until the list starts up again. Hopefully, it will just be a couple of days. Some more information has come to light about the film Simple Minds have written the soundtrack for. Full information, in German, is here. The Bavarian Broadcasting Service is travelling in the world of fairy tales: the International Movie Production's Sawdust Tales tells the story of the circus Ialoa which has to flee its own country. While the artists are waiting in a harbour town for their deparature, the dreamy tight-rope performer Issac (Hugh O'Connor) falls in love with a beautiful Mermaid (Julia Brendler). Their love finds a tragic end. Two more web sites have appeared over the last couple of weeks. You'll find their links in the links section. The Helium website finally shows some signs of life! Unfortunately the full site isn't available yet but a release date of December is given. Both arrived recently in the mail and you'll find full details of their contents in the fanzines section. The new Simple Minds compilation has turned up for sale in the UK. I found several copies in my local HMV Record Store so it looks like their distribution is wider than anticipated. There's some confusion surrounding The Promised - it's been advertised as "The Best" and "The Best Of The Promised". The title is simply The Promised . Interestingly I've heard rumours of a second Proms CD to be released in December. This five track CD is going to feature the band at the concert. This would be excellent news if it's true. I'll be checking it out. After speaking to both Simple Minds Limited and Chrysalis Records I have been unable to confirm the title, track listing or any other information about the forthcoming Simple Minds album. Jim and Charlie are still in Capri mixing the album - nothing else is known. However, everyone I spoke to simply stated that they had no information. Perhaps the news is taking time to filter from Italy to the UK, and I may soon be in a position to confirm the album title and track listing that Giuseppe's posted on his web site (see Alive And Kicking in the links section). I really hope that the track listing represents the album as it looks very interesting. Unfortunately the involvement of Mick MacNeil in this project was denied. Information on the new compilation CD The Promised has now been uploaded. The Other Info section now features an updated For Sale, Trades and Wanted section . Now called The Marketplace it's where Simple Minds fans can sell, trade and advertise for wanted items. The Proms concerts are definitely going to take place. The contracts have been signed and a full list of the confirmed tour dates, directly from Simple Minds Limited, are available in the tour section. The new compilation album has also been released. Titled The Promised, it's been turing up in the countries where the Proms concerts are taking place. More information will be given on The Promised once I've got a copy - imports to the UK are being rather slow at the moment! The links section has also been updated. The first Spanish site has appeared - watch out for an update to the For Sale section soon. And finally, this site has received a Lycos Top 5% award - officially making it one of the top band sites on the Internet. A link to Lycos, where you can find their review of this web site, can be found on the title page. Simple Minds' new studio album is expected to be finished very soon. Its likely release date is early next year. It is also unlikely that Simple Minds will release a single this year - the release date of September 22nd, which is floating around the Internet, is false. Jim Kerr has not worked on a track with Annie Lennox for a forthcoming album or concert. These rumours stemmed from a charity, or benefit, concert to be held for the people of Tibet. The concert was to have taken place in Edinburgh - hence Simple Minds' proposed involvement. However the venue has moved, and Simple Minds are fully booked for the rest of this year, so it's 100% certain that neither Jim, or the band, are involved. Simple Minds are currently involved in negotiations to play a series of Proms concerts across Europe. They have yet to sign the contract - but it's very likely that these concerts will take place. No definitive dates are available yet, but they will appear on this web site when everything is confirmed. But proposed dates range from 30th October to the 4th December. The Proms concerts have taken place across Europe for a couple of years now. They combine a full orchestra with a choir and a rock band. Previous bands have been Joe Cocker and Sting. The plan is that Jim and Charlie will play for 30 minutes and be backed by the orchestra - none of the other members of Simple Minds are expected to play. The set list will be : Don't You (Forget About Me), Alive And Kicking, Belfast Child and Someone Somewhere (In Summertime). (The last track is unconfirmed). A special edition of the album Glittering Prize 81/92 is planned for release. It will feature She's A River and Hypnotised - two existing tracks will be removed to make room for them on this new version of the compilation album. It will also feature brand new artwork. It will only be sold at the Proms concerts, and is probably intented as an introduction to the band for the concert goers and not as a release for existing fans. Everyone is still waiting for the long delayed Helium web site to appear. Simple Minds Management was unable to give me any more information - they're waiting for something to happen like the rest of us. Apparently it's going to be "soon...soon...". Updated the tour dates with extra information and set lists. Giuseppe's started his new web site - a link can be found in the links section. Jens Jokschat has updated his list of items for sale - check out his list in Other Info section as he'll soon be closing the sale. I've returned from Loreley and Hamburg. Excellent concerts! The set list was the same but the new song titles have been confirmed. Simple Minds Magazine are now called Endless River - the link to their web site is given in the Other Info section. Highly recommended as they feature news and pictures from the latest gigs. I spoke to Jim in Hamburg and he confirmed that the band had also practised Changeling and Premonition. These song titles turn up along with Colours Fly And Catherine Wheel, and Up On The Catwalk on a document which was photographed on mixing desk - this can be seen on the Endless River page. Two other titles shown on the sheet are a mystery and could be abbreviated song titles. Two new dates have been added to the tour list: July 6th finds the band in Belfort, France whilst they are in Austria on the 18th. The concert in Denmark has now taken place. The set list in incredible - those travelling to the festivals over the next couple of months are in for a real treat. Two new songs, two songs from Empires And Dance, the return of New Gold Dream (81,82,83,84)... check out the tour dates section for the entire list. An official Simple Minds web site has appeared. Currently it's little more than one graphic - the launch date should be anytime soon. Currently little is known about it except its name - Helium. You'll find a link to it in the links section. Beware of non-confirmed tour dates. Check out the tour dates section for a warning. Totally revamped the Other Info section. Added a For Sale, Wanted and Trades section. Here you'll find the first sale from this site - fancy a Themes Volume for 10 pounds sterling? Take a look! Hamburg is now confirmed for the 22nd of June. There's also some extra information on the tour dates section. Links to another Italian Simple Minds web site plus updated information about Le Menti and Who's Doing The Dreaming Now have been added to the fanzines section. Finally the long awaited Bootlegs section has been started. Currently the only bootlegs detailed are those for Good News From The Next World - I'll be completing that section over the next few weeks. You'll find the link in the bootlegs section. I now have a list of confirmed festival dates from Simple Minds Management. Check out the tour dates section. Another Simple Minds web site has started. Matt's Real Life pages feature a picture gallery - posters, ticket stubs and more. You'll find the link in the links section. Updated the fanzine and web site links in the fanzines and links section - there's some new web sites you might not be aware of. I understand that the Hypnotized fanclub has now folded - the Hypnotized web pages will not be available for a while. Mel Gaynor, Simple Minds' drummer from 1982-1991, met up with Simple Minds in London on the 27th March 1997. He described the meeting as "very emotional" . Mel will be drumming with the band when they play a set of festival dates over the summer, which is excellent news! Additionally an interview with Mel appears in the Simple Minds fanzine Who's Doing The Dreaming Now Issue Three. It is now confirmed that Simple Minds will play some festival dates in Europe this summer. Once the tour dates themselves are finalised then they will appear on this web site. The new album is half completed. A September release date is now looking a distinct possibility. The album still does not have a title. Some bad news from their record company Chrysalis . The album will not be released until September. This does tie-in with the fact that the album is still being mixed. However, the new single will be released in June. And this coincides with the rumoured live dates! So, not too long to wait. Latest information about the new album is in the news section. Looks like a single in the summer with the album being released in the autumn. The second issue of the Dutch fanzine Simple Minds Magazine is now available. Details of this, and the third issue of Who's Doing The Dreaming Now which is in preparation, can be found in the fanzines section. The Simple Minds e-mailing list New Gold Dream is now up and running again. Subscription information is given in the mailing list section. Finally, a new US radio show section has been added to the discography. This details all the bands known shows pressed up on special radio show programmes. 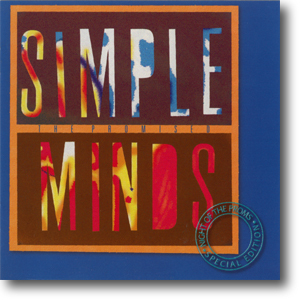 I decided to clarify all these rumours and so I called Simple Minds Limited. I've been told that the band are still mixing the album. There is no release date yet. And the album does not have a title yet. Therefore all these rumours of releases and album titles are false. Some rumoured tour dates have been circulating; you'll find those on the tour page. The fanzine, Le Menti, has a new issue out. Check it out in the fanzines section. It is rumoured that the new album is titled BVT or BWT. And the May release date is continuing to stand. I'm now hearing rumours of a mid-April release date for the single. As soon as I hear anything, I'll post it here. It's now looking increasingly likely that the new album will be released in May. It has now been confirmed that Simple Minds are writing the soundtrack music for a film called Sawdust Tales. At present, there is no firm release date for either the soundtrack or the film. This fantasy film is about a circus at the end of the world . It's a German production and filming has been taking place in Budapest. Added some more information to Michael MacNeil's biography page. The Simple Minds e-mailing list, New Gold Dream, will soon be up and running again. Once it is, I'll provide details for those wishing to join. The producer, exclusively named in Who's Doing The Dreaming Now is Peter Walsh. He's well known to Simple Minds fans, since he produced their 1982 classic album New Gold Dream (81,82,83,84). A release date is still not finalised, but the latest I've heard is before Easter .